We want to be your trusted kids party face painting entertainment choice. Q: How fast can you face paint? A: The key to face painting children quickly lies in how they sit still. Unfortunately, when you rush young participants they often grow anxious and squirm. Our artists will, of course, work as quickly as they can. However, we prefer to make the experience a pleasant one by taking some time to engage young participants. You would be amazed at the smiles we get by simply asking a child who their favorite princess or super hero is. However, there are a couple of tricks we with your help can use to move a little more quickly and accommodate a greater number of participants. We can offer limited colors and designs. In addition, you can erect a mirror for the children to look at themselves in. This will get them out of the face painter’s chair more quickly and enable her to move on to the next participant. Q: If you only paint small images, can you move more quickly and accommodate a greater number of participants? A: No, this is a very common misperception. A small image that has a lot colors and detail, like Ariel, takes a lot more time than a full face Spiderman or butterfly. So if you wish to maximize the number of faces painted per hour, we recommend large or full face images. Another benefit of larger images is that they make a bigger, more visible, splashy impression. Q: What are your face painting rates? A: We require a 2 hour minimum booking per artist. Our normal rate is $150/hr per artist. However, we are currently running a special promotion offering up to 33% off depending on the pricing package you select. Click and scroll down to see our Chicago area face painting pricing packages. In each pricing package, you will see a recommended number of faces to be painting. If you agree to this recommended number of faces to be painted, our artists will be able to paint complex design options or any special requests for your guests. Of course, you can request a higher number of faces to be painted that what we recommend. We're happy to accommodate your request. But please keep in mind that if you request a higher number of faces to be painted, your guests will be required to select from a selection of less complex, yet still artistically beautiful designs to choose from, and we will not be able to do special requests. Having said that, please don't worry about shoddy designs. We pride ourselves in the quality of our designs whether complex or less complex. See our face painting photo gallery. Also keep in mind that the actual number of faces painted at your event could vary because if the children are particularly fidgety, they take longer to face paint. We have tricks to get kids to be less fidgety, so we will do our best to meet the requested number of faces to be painted. Q: Why do children need to have elaborate designs painted on their faces? Can't I just ask you to paint simple and faster designs so that you can paint a large number of kids in a short period of time? A: It may sound self-serving, but elaborate designs are the best way to go. First of all, elaborate designs will noticeably enhance every child's self esteem. For example, without fail little girls will visibly light up with energy and a huge smile and exclaim "I look adorable!" when they look in the mirror after being face painted by our artist. Secondly, kids really enjoy the reactions they get from others who see the beautiful design on their face. Thirdly, it adds incredible fun to a party when kids literally transform into the character associated with their elaborate face paint design. They get so full of energy and and are so cute acting the part. Lions can roar...dogs can bark...cats can purr...Spiderman can shoot webs...the Hulk gains strength. Finally, offering elaborate face art gives kids a chance to flex their creative spirit. They can choose to become any character their imagination desires because our artists can turn them into anything they want to be. Of course, elaborate designs will also make the photo memories that much more special. Having said all of this, we are certainly happy to limit the selection of designs your guests can choose from in order to increase the number of faces we can paint in the allotted time. The "quick" face paint designs are still very appealing. Q: Do you accept last minute bookings? A: Yes. 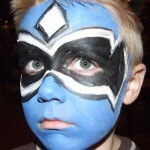 We have expert face painting artists located all over the Chicago metro area. Therefore, in almost all cases we can find a talented face painter to meet your needs. However, the earlier you contact us to reserve your date and time, the better the chance that we will have artists available for your event. Q: Why are you offering such nice discounted face painting rates? A: We understand how expensive it is to host kids parties and community events. So we thought it would be a nice gesture to offer our top quality face painting at a nice discount. Our goal is to lower the cost barrier enough to earn your business. And once you see the incredible reaction of your guests to our beautiful face painting, we know you'll be calling us again for future events. Q: Do you offer additional discounts for Non-Profit Organizations? A: Yes. Under our current promotion, Non-Profit Organizations are entitled to an extra 10% discount off whichever Pricing Package is selected (minimum booking of 2 hours per artist, please). Q: I am not a Non-Profit Organization. But how can I get a deeper discount? A: Consider hosting your kids party or event on at Monday, Tuesday, Wednesday or Thursday (holidays excluded). For a limited time, we are offering an extra 10% discount on our services for events booked on these days. Requires minimum booking of 2 hours per face paint artist or balloon sculptor. Q: Your hourly rate and 2 hour minimum is above my budget. Are your prices flexible? A: We hope that you will comparison shop, because we are confident that you won't find better quality or better prices from any other face painters. And most clowns and magicians have higher rates. We go out of our way to keep our prices affordable. After you see the huge smiles on the kids and adults at your party, you'll know that Artistic Face Painting was worth every penny. Q: Your hourly rate seems kinda high for just face painting. Why? A: In a nutshell, our artists need to earn enough to eek out a very modest living doing face painting. None of our artists works anywhere near 40 hours per week doing face painting because there just aren't that many face painting events to make it a job that generates a ton of billable hours. With far less than 40 hours of face painting work available each week, we need to charge more per hour than some people think is justifiable. But please note that our rates are still lower than most other face painters as well as being lower than most clowns, magicians, musicians and most other forms of kids party entertainment. Give us a try. You won't be sorry. 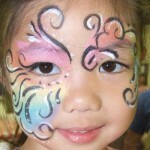 Your guests will love the quality of our face art and the friendliness of our Chicago area face painters. Our talented, dedicated artists love to put huge smiles on the faces of kids, teens and adults. A: No. We provide every client with a written quote for approval before the event. Our hourly rate includes the artist, booking administration costs, face paints, supplies, insurance and normal Chicago area driving time and fuel costs. Q: Must I book a minimum number of hours? A: Yes, we do require a minimum booking of 2 hours per artist. Q: What if my kids party is only 1 1/2 hours long? A: We still require a 2 hour booking. If your party is only 90 minutes long, we will send our face painting artist to arrive 1/2 hour early to face paint the guest of honor, siblings, parents, grandma and other early arrivals. It will add even more excitement when people arrive and see the guest of honor already face painted. Q: What happens if the artist has nothing to do and hasn't used up the 2 hours? A: From the day we first started painting faces in 2006, we have NEVER had that happen. Usually children are practically taking off their clothes to have every area on their body painted. And teenagers and adults at the party are ALWAYS eager to jump in to get face painted when they see how beautiful our designs are. In fact, we almost always turning people away when our allotted time is up. Q: If there is still a long line of kids, teens and adults waiting to get face painted when the allotted time is up, can your artists stay and work overtime? A: In almost all cases, yes. Our artists would be more than happy to stay beyond the allotted time. The overtime rate would be $75 per HALF hour per artist, but this is currently reduced to $60 per HALF hour per artist since we are currently running a special promotion. Q: What do your artists need me to provide for them at the event? A: Just a small table to place the face paints on and two chairs. Q: Can I request that only certain face paint designs be offered to go along with my kids party theme? A: Most definitely. For example, if you have a girls fairy princess party theme, we can limit the girls choices to the appropriate princess-related face art options. Q: How do your artists approach children who are afraid? A: We usually ask them to sit on their parent's or older sibling's lap. Often we will paint mom or dad or older sibling first, so that hey can see that it doesn't hurt and is actually fun and exciting. If a parent or sibling is not present, then we ask them to watch a happy/willing friend or another child be painted. Q: How long will the face paints stay on? A: We use top quality Snazaroo face paints. They are hypo-allergenic and easily wash off with soap and water. If you would like the face painting image to stay fresh, we recommend keeping it dry and not touching it, especially when sweating. Q: What should I do if I am having a pool party? A: Schedule our artists to come at the end, when the children are done swimming. Q: How do I control who is eligible for face painting if I am having a block party or festival in an open, public place? A: We recommend that you give tickets or wrist bands to those who are part of your group. You'd be surprised at how many kids, teens and adults from outside your group will try to jump in on the fun and get their faces painted. Q: Is it necessary for children to stand in long lines to get face painted? A: No. We understand how much effort you have put into your event. So we don't want your guests standing in line. We want them to enjoy all the activities and food and fun that you have planned. To prevent lines, we have a sign-up sheet at our face painting table and when a guest signs-up, we give an estimated time to return. If the guest returns too early or too late, we happily squeeze them in. Q: Do your face painting artists also do balloon sculpting? A: No, all of our face painters are very talented artists, but most are not balloon twisters. We do, however, have balloon sculptors on staff for the same hourly rates as the face painters. Q: Can I request a specific artist on your staff? A: Sure! Simply, provide us with his or her name and we will see if he or she is available. Q: May I request the gender of the artist? A: Yes. We have both male and female artists on our staff. All our artists are professional, courteous and great with kids, teens and adults alike. But if you have a gender preference, we'll do our best to accommodate your desire. When you submit the Contact Form containing your event details, just indicate your gender preference. Q: Can your face painting artist dress up as a clown? A: No, our artists do not dress up in costumes unless you make a specific request. If you would like your artist to come dressed up, there is an additional charge of $70.00. We recommend, however, that you choose a character other than a clown. Unfortunately, children are often afraid of clowns. Just one child screaming in fear at the clown will put a big damper on the festivities at your kids party. Q: What face painter's costumes do you have on hand and recommend? A: The most popular costumes are Cinderella, Tinker Bell, Prince Charming, Mermaid, Buzz LightYear, Woody and Spiderman to name a few. Q: What about your face painter dressing up in character costumes like Dora or Elmo? A: No, we are sorry, we do not have these costumes available. Besides, they would be too bulky and difficult to manage for our face painting artists. Q: What if one of the children at my party has a special face paint design request? A: No problem. Our artists can paint just about anything. If our artist is not familiar with the design requested, just pull up an image on your smartphone and our artist will duplicate it. Q: What parts of the body can designs be painted? A: We can apply beautiful body paint designs on the face, cheek, arm, ankle, shoulder, stomach or back. We have even painted designs on on the back of bald heads! It was really a site to see! A: Yes. A certificate of insurance can be provided upon request. Q: Are tips included in your hourly rate? A: No. If you and your guests are pleased with the face painting service, our artists would be thrilled to receive a cash tip. A: No, not directly. But we can send you a PayPal payment request. You can set-up a free PayPal account, enter your credit card into your PayPal account profile, and then send us payment using that credit card via PayPal. 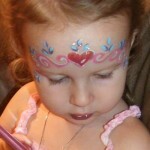 Q: How do we submit face painting photos for inclusion on your website? A: Please fill in our Contact Form and let us know that you have photos you'd like to share. We will then send you instructions on how to submit the photos. Q: Where can I see your artists in action? A: Check the See Us page on this website for the latest public events at which we will be providing kids entertainment. You can also see us in action any Tuesday, Friday and/or Saturday evening at the Fox's restaurant locations in Orland Park and Mokena. Q: How do I reserve one of your artists? A: Please submit our Contact Form. We will respond as quickly as we can with confirmation about our availability. But since we have a number of talented face painting artists around the entire Chicago area, the odds are excellent that we will have someone available.